This amazing automatic computerised kiln is truly a kiln of many uses. Originally designed for porcelain firings, it also happliy fires Contemporary Ceramics, china painting, decals, gold overglazes and even stoneware and porcelain in its stride; even ultra fast firing if necessary. The advanced 12 key computer controller means it is idiot simple to fire, fast or medium speed for earthenware as in the cafes, parties and hobby ceramic businesses, but just as easy to go to the other extreme, firing slow and steady, for fine grained porcelain or heavy stoneware. The size is ideal for the busy hobbyist, yet the 16½" x 13¼" deep chamber is big enough to takes a very substantial ceramic or stoneware vase, bowl or Christmas tree, or its 1.75 cubic foot capacity swallows a whole pile of smaller items. The insulating firebrick sidewalls are ½" thicker than standard firebrick and are hand selected. 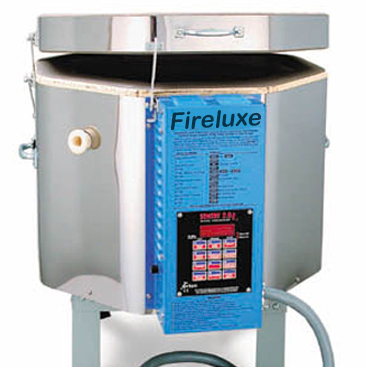 This gives a very efficient firing kiln with lower heat loss, and the ability to high fire economically. The kiln needs a 30 amp connection, just like your cooker or shower, and packs a massive 6500 watts punch, more per cubic foot than conventional kilns. The extra wattage is ample for cone 10 firings if required, but for most people the advantages are that the extra power helps compensate for ageing elements or low voltage. The elements also last longer in normal use, because the extra wattage and thicker firebrick give easy firing with less strain on the elements. If desired, this kiln can give incredibly fast firing rates. The controller is very, very, simple to use; or the advanced enthusiast can set to run your own individual complex specialised firing programmes. The choice is yours! Enter a pyrometric cone number and speed to begin firing or develop your own firing profile with up to eight stages. You can use the delay fire feature to suit your firing schedule. The kiln displays the temperature throughout the firing and cooling. The Sentry 2 controller that you will find on this kiln has many, many features, delays, offsets, holds, you can enough ask it to calculate the firing cost in electric of previous firings! Vent in two stages with the fall-away Prop-R-Vent. Dropped, recessed brick grooves, pioneered by Paragon, protect the elements for longer life. The full-formed steel base strengthens the kiln and completely covers the reversible brick bottom. Each kiln comes with its own stand, complete with grippy plastic feet, a full furniture kit, and a detailed instruction and service manual. The warranty is for a year on the kiln, 2 years on the computer, and you'll get our advice and support for as long as you need it! All prices plus delivery (if required) and VAT, continue to shopping basket for final price. 1 inch wide Square Posts, 3 of each in heights: 1/2", 1", 2", 3", 4", 6"
Fireclay shelves and posts used inside the kiln are called 'furniture'. With furniture, you can stack more ware in your kiln than you ever could place on the bottom of the kiln alone. `Furniture Kits' are the shelves and posts we recommend for each model. They have been selected to accommodate a wide variety of work for your particular kiln. Shelves up to 15" wide may be fired to cone 10. Shelves wider than 15" may be fired to cone 8. Shelves may warp at sustained cone 10 temperature, therefore, we do not guarantee shelves against warpage. A minimum of 12 inches or 30cm of additional clearance is required on all sides of kiln during operation. Firing chamber depth of a top loading kiln is measured from top to bottom.